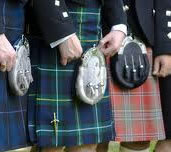 Please ask us if you would free advice on your wedding day about wearing the kilt. We would be delighted to spend 10 minutes, prior to your ceremony, with the male guests of your wedding party. This service is free of charge. When it comes to dress and deportment, it is our attention to detail which makes us the recommended supplier of pipers to Scotland's leading hotels. 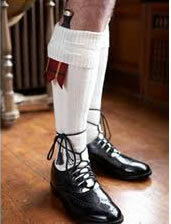 We are pleased to offer the following advice with regard to wearing a kilt and Highland Dress on your Wedding Day. Most Pipers find it easiest to dress from the bottom up, so we have presented our guide in a similar fashion. The most common, but easily made mistakes people make when wearing a kilt are to have their socks pulled up too high (like football socks! ), and to tie the laces many times around their legs. The socks should be roughly two to three fingers beneath the knee, whilst the laces should be crossed once and tied horizontally at either the front or the sides. As long as they are both uniform, it is just a matter of preference. We think they look best at a 45 degree angle. The Flashes should be at a 45 degree angle, and the Skean Dhu should be inserted in the right sock at a similar angle. The kilt should sit either 'just above', or 'just on' the centre of the knee (when standing). The Sporran should rest just beneath the pubic bone, sitting neither too high nor too low. You may often find that it sits naturally towards the middle cross on the tartan, depending upon the design (please see image right). Most pipers do tend to wear underwear as this is much more hygienic and saves everyone any embarrassment when bending over and getting in an out of cars! We tend to leave the 'going commando' element to the Tartan Army! As long as your jacket is of a correct fit then there isn't really too much to remember here. 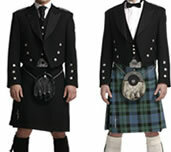 If you are wearing a Prince Charles style jacket (see left), then the Kilt Belt is not mandatory and may be left off.